It’s good to pause every so often as you are trying to make a point, if only to ensure that your latest statement is consistent with what got you going in the first place. You might well be making a worthwhile claim, but if in the meantime you have wandered so far off the path and run out of breadcrumbs, your audience will grow tired and let you go. My starting point was the question about the role of religion in human development, and how religion itself evolves with the advancement of individual consciousness over the lifespan. One of my basic claims is that individual consciousness engages reality at three distinct mental locations, each location opening out to a realm of experience corresponding to this point of contact. Thus body, ego, and soul are not pieces or separate parts of a human being, but mental locations where individual consciousness opens out to the animal, personal, and spiritual realms. I’ve done my best to head off the tendency of regarding these so-called realms as metaphysical planes of existence. Alas, metaphysical realism is a sticky trance to shake off. Another gross misreading identifies the ego-soul (a disastrous conflation that leads to numerous corruptions) as “the real me,” literally throwing off the body like a cheap coat or temporal costume. Body is our animal nature, animated by the life-force (anima), and the mental location where consciousness is involved in animality (i.e., in the dynamics of animal life). 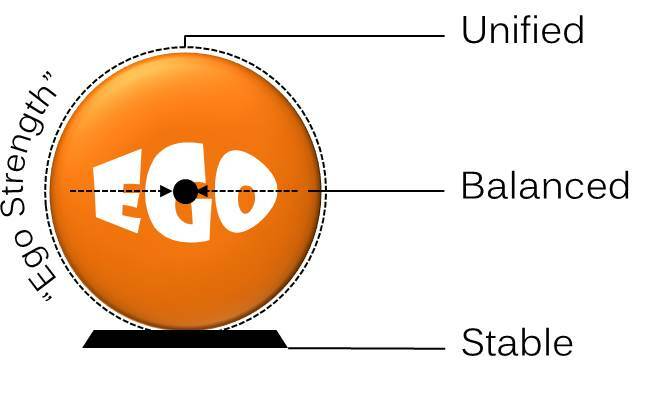 Ego is our personal identity, which is acted out through a variety of personae (social roles and masks), and serves as the executive center of our personality. And soul is our spiritual presence, the inner wellspring of spirituality and deep ground of the human spirit. Their associated realms comprise the sensory-physical (body), socio-cultural (ego), and intuitive-esoteric (soul) – as long as I can rescue the term “esoteric” (literally inner) from the secret-knowledge (gnostic) spiritualists and crackpot metaphysicians. As the above diagram illustrates, these three mental locations are oriented respectively on the three concerns of life (body), self (ego), and being (soul), with each concern attracting secondary concerns and values into a coherent system of motivation and behavior. We are interested in different things depending on where (at what mental location) we are engaging reality at the moment. It’s also important to see that this arrangement of concerns is not static, but rather evolves dynamically over the course of a lifespan. Infancy and early childhood is a “body-dominant” developmental period that gives rise to an “ego-dominant” period in later childhood and adolescence, which may in turn break through to a “soul-dominant” mode of being. To a certain degree the success of each of these transitions is a function of how well things went in preceding periods. A body that wasn’t providently supported in early life, for instance, will become an insecure base for the developing personality. The neurotic styles are “adaptive” not because they support higher health and wholeness, but because they help our juvenile personality resolve the body’s underlying insecurity by taking control – “acting childish” in some way. Throw a tantrum and a higher power will pay attention and try to pacify you: that’s how you get your way. Of course, the effectiveness of such tactics drops off dramatically as we enter the adult sphere of relationships and responsibilities. Needless to say, ego formation is a complicated business and none of us comes through the gauntlet without some emotional bruises, scars, hooks, and quirks to show for it. One way that we compensate for insecurity is by gripping down on what we believe – about ourselves, others, or god; about the way it was, is now, or will be. Cognitive certainty, as unshakable confidence in the absolute truth of our statements about reality, doesn’t really address the insecurity knotted up inside us. But with time and practice we can eventually fall under the spell of our own convictions. In my post “God Above and The Ground of Being” I took a closer look at the phases through which personal identity develops, along with the type of religion (theism) that orients, guides, spurs and attracts its development. 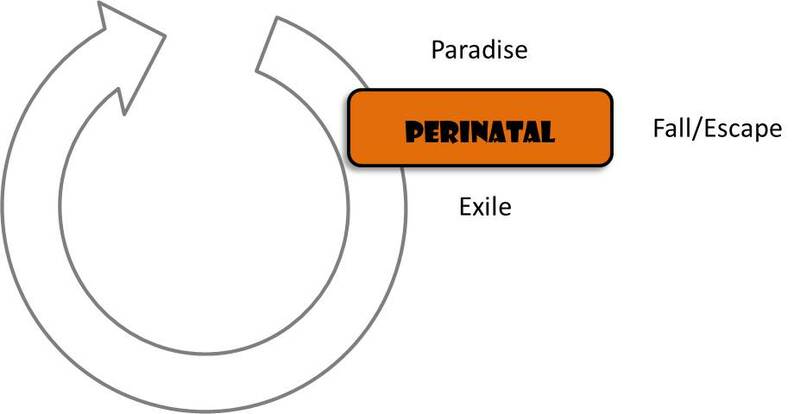 Those phases are labeled in the diagram above: the dawn of identity in storytelling (imagination, fantasy, role-play), through the midday of ceremony where the broken time of secular life is ritually joined to the deep time of sacred story, and at last entering that twilight phase of orthodoxy, with its blessed certainty concerning the ultimate nature of things. While this cognitive certainty (or dogmatic orthodoxy) might serve as adjustment therapy for the insecure ego, it is dangerous indeed in the way it blocks progress into a more spiritually grounded existence. Holding fast to belief may calm anxiety and shush our doubts, but it also pumps more energy into something that needs to be dropped and left behind: the ego itself. As a legitimate mental location of consciousness, ego engages us with the realm of tribal membership, conventional morality, and social recognition. It’s here that we work out who we are and hope that God Above is pleased with us. But what happens when the deeper impetus of our human development, which must ultimately transgress the boundaries of social identity to engage the soul and its grounding mystery – what happens when this gets held up and pulled back into the ego? My word is inflation: the ego becomes even more dogmatic, conceited, bigoted, and defensive. At this point, its counterpart in God Above starts to take on the character of a judgmental, glory-seeking, and vengeful deity. Coincidence? I bet you can look down through history to those periods when God Above was especially stern, vindictive, unforgiving and merciless, and you will find insecurity and ego-inflation running rampant among his devotees. Don’t get me wrong, as a system of religious support and orientation theism promotes human fulfillment – or I should say, healthy theism does this. As long as egos are around and people live in societies where membership means something, theism and its patron deity are here to stay. In the best of all possible worlds, orthodoxy wouldn’t exist. Believers would be encouraged to the edge of certainty and allowed to contemplate the mystery that can’t be named. They would be challenged to let go of their need to be right, to let go of their need for assurance, to let go even of their god. And with a gentle push, they would learn that they can fly. It’s interesting how the evolution of life, the development of a species, and the maturation of individuals within a species all tend to proceed from simpler to more complex forms and stages of existence. The human embryo carries vestigial gills and a tail from our prehuman ancestors. In a not entirely dissimilar fashion, children grow into mental abilities following the same sequence as our species over many thousands of years. What we see at one level (life, species, individual) is evident in the other levels as well. Culture is the construction zone where the degree of advancement in our human species gets transmitted from individual-level breakthroughs, into the collective consciousness of society, and back again to the individual in the form of innovations in the traditional way of life. In the interest of social cohesion and stability, a preferred path of change would be able to keep some of what has been (as tradition), as it moves forward into what will be. The role of institutions can be understood in this sense, as conservative and stabilizing structures in the flow of cultural change. The very definition of religion, from the Latin religare meaning “to connect or tie back,” identifies it as an institution in this sense – indeed as the conservative and stabilizing structure in culture. When the European Enlightenment got the intelligentsia excited about the possibility of throwing off the superstitions of the past to embrace a future of science, religion was the obvious and easy target. Without a doubt, there was much about the institution of Christendom that wouldn’t listen and constructively respond to new discoveries and developments going on at the ground level of human experience. As the official Church condemned new theories and excommunicated the brave souls who dared contradict its now-archaic orthodoxy, the best (and perhaps the only) recourse for many was to simply push the whole outfit into the ditch and move on with progress. The modern West turned its attention to factual evidence and the technical possibilities of this world, content to leave spirituality, religion, and God Above in an early chapter of its new autobiography: The Enlightened Man’s Emancipation from Ignorance and Myth. The Christianity we all know (and fewer of us love) is a type of religion known as theism, for the way it is oriented on and organized around the belief in a supreme being who is large and in charge. Our fortunate birth and prosperity in this life, followed (hopefully, if we get it right) by beatitude in the hereafter, is our Pilgrim’s Progress supervised by God Above. We happen to be living in the twilight of theism, during a late phase known as orthodoxy. At this point it is primarily about believing the right things, and doing whatever it takes to defend and propagate “the one true faith” around the world. By now, for a large majority of Christian true believers, the present mystery (we can even call it the real presence) of God has receded permanently behind something much more pressing and important – and manageable: the right opinion (ortho+doxa) about God. At the end of the day it’s all a very heady enterprise and increasingly irrelevant to everyday life. People are leaving the Church in droves, with the Enlightenment campaign of atheism once again on the rise. As a counter-measure, the engines of orthodoxy are locking into gear and plowing full steam ahead, until Jesus comes again or all hell breaks loose (rumor has it these might be the same event). Fundamentalists, ultra-conservatives, and right-wing evangelicals are certainly not helping their cause, as bright and reasonable people who continue their quest for a grounded, connected, and personally relevant spiritual life are leaving the crazies to their end-game. I spend more time than I would like trying to explain how the impulse to cast theism out with the dirty bathwater of dogmatic and dysfunctional religion, while certainly understandable to some extent, is not the real solution to our problem. For one thing, the theistic paradigm and its role in society should not be simply identified with any of its historical incarnations. In other words, a corrupt version of theism is not necessarily a reason to reject theism itself outright. It happens that every institution is prone to desperate measures when threatened by the natural course of change. In this way, an institution is the cultural equivalent of an individual ego – a conservative and stabilizing construct of identity that resists becoming what it isn’t used to being. What follows is a perspective on theistic religion, exploring its development through distinct phases starting with its rise out of animism and following through its twilight into post-theistic forms of spirituality. 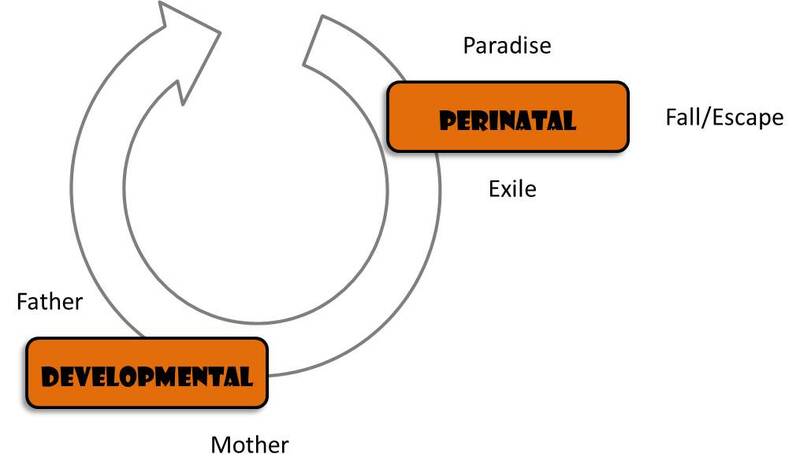 My model for this developmental schema is not only based in the evidence of archaeology, but, just as important and even more useful, on the phases stretching from early childhood to maturity in the living individual today. Earliest theism, just like early childhood, was lived in a world constructed of stories. There was no obvious boundary separating “fact” from “fiction,” the given facts of reality from the make-believe of fantasy. Theism was born in mythology (from the Greek mythos referring to a narrative plot, which is the structural arch that serves as the unifying spine of a story). Its gods began as literary figures personifying the causal agencies behind the order and change of the sensory-physical realm. Myths were not regarded as explanations of reality (as a kind of primitive science), but instead were performances of meaning that conjured the gods into being with each rendition. It’s difficult to appreciate or understand this phenomenon as we try to grasp it with adult minds, but perhaps you can remember how it was for you back then. The fantasy world of myth doesn’t merely fade into the metaphysical background when the story concludes. Rather, that world exists only in the myth and is called into expression every time the myth is performed afresh. We modern adults entertain a delusion which assumes the persistence of reality in the way we imagine it to be, even when our stories (at this later stage known as theories) aren’t actively spinning in our minds. The paradigm-stretching frontier of quantum physics is confirming how mistaken this assumption is, and how much we really understood (though perhaps not consciously) as children. At some point in late childhood and early adolescence the individual recognizes that real life requires an adjustment from imaginary friends, magical time warps, and free-spirited performances of backyard fantasy, to the daily grind of household chores and lesson plans. A more complex and complicated social experience means that opportunities for reigniting the creative imagination must be “staged,” that is, relegated to a consecrated time and location that will be relatively free of interruptions. Here, in this sacred space, the stories will be recited; but in view of limited time, only the major scenes and signature events are called to mind. The required investment of time, attention, and energy in social responsibilities will not return the degree of enchantment and inspiration an individual needs to be happy. There needs to be a place for mythic performance and reconnecting with the grounding mystery. Besides, the mythological god can’t be left hanging in suspended narrative when it’s time to get back to the grindstone. Theism had to adapt along with this emerging division between sacred and secular (temporal, daily) concerns. It did this by creating a special precinct where the majority could enter and observe an ordained minority dress up, recite the stories, and enact mythic events linking their broken time (divided and parsed out among countless duties) back to the deep time of an eternal (timeless) life. Just as the holy precinct of ceremony served to connect a profane existence “outside the temple” (Latin profanus) to the sacred stories that weaved a tapestry of higher meaning, the god who originally lived in those stories was relocated to a supernatural realm overhead, standing by and watching over the business below. Even if the stories weren’t actively spinning, people could take comfort in knowing (technically believing) that he was in his place and doing his job. On a designated day the community gathered in the temple, and at just the right moment an official would sound a bell, light a candle, unveil an icon, or recite a scripted prayer invoking (calling in) the presence of the god. At that very moment, all were in agreement (at least those paying attention) that the deity would descend from his abode in heaven and receive their worship. A ritual enactment of sacred story would typically culminate at a point where the congregation was invited to step into deep time once again. Afterwards a signal was given bringing the ceremony to an end, and the people would depart to their workaday worlds. With a growing population and the inevitable pluralism that comes with it, getting to the chapel on time becomes more of a challenge for a lot of people. How can theism survive when the ceremonies and sacred performances start losing attendance? What happens when god above no longer has an official invitation to condescend to the supplications of his gathered assembly of devotees? This is what happens: former true believers give up their denominational affiliation and do their best to continue on their own. They will still look up when they speak of god, point to heaven and cross themselves when they score a goal, and perhaps bow their heads and say a prayer before breakfast. Once in a while they might make their way back to the chapel (maybe on time) to observe a performance of one of the really big stories. As they watch, a dim memory of childhood enchantment will stir somewhere deep inside them and they will feel the magic once more. How can theism hold on when its ceremonial system – the land and buildings, the gold-plated symbols and silken vestments, the professional staff of ordained ministers, and the hard-won market share of rapidly defecting souls – is sliding into obsolescence and bankruptcy? The answer brings us to the third and final phase in the lifespan of theism, the twilight of institutionalized religion known as orthodoxy. The enchanted storytelling of early childhood gives way to staged ceremony in young adulthood, which in turn and with further reduction eventually gets packaged up into neat boxes of truth called doctrines. An obvious advantage of this reduction of theism to doctrines lies in its handy portability, in the way it can be carried conveniently inside the head and transferred into more heads by rote memorization and Sunday School curricula. If the first phase of theism (storytelling) featured the bard, and the second phase (ceremony) depended on the mediation of priests, this third phase (orthodoxy) belongs to the theologians. They are the experts who tell us what to believe about god and other metaphysical things. Since theism at this point has become a rather sophisticated set of beliefs, the best (and perhaps only) way to impress their importance on its members is to make the doctrines necessary to what more and more people are lacking and so desperately looking for: security and longevity – specifically that odd fusion of security and longevity defined in the doctrine of everlasting life. As time goes on, this notion of a future escape from a life burdened by fatigue, boredom, and absurdity grows more attractive, until the true believer is willing to give up everything – or, if necessary, to destroy everything – for its sake. In the Age of Orthodoxy people still speak of the god above, of the miracles of long ago, or of a coming apocalypse and future rapture of the saints, but you’ll notice that the critical point of reference is consistently outside the present world. Celebrity hucksters and pulpiteers try to fill the vacuum with staged demonstrations of “faith healing” and prophetic clairvoyance, but the inspiration is cheap and unsatisfying. Mega-churches and sports stadiums become personality cults centered on the success, charisma, theatrics, and alluring ideal of their alpha leaders. In a sense, this transformation of old-style sermon auditions into entertaining religious theater represents a final attempt of theism to push back the coming night. There’s no getting around the fact that orthodoxy just isn’t that interesting, and as it rapidly loses currency in the marketplace of relevant concerns, more and more people are saying good-bye to church, to organized religion and its god-in-a-box. As a cultural transition, the crossover from managed religion to something more experiential and inwardly grounded corresponds to that phase for the individual, when a deeper thirst for life in its fullness forces him or her to push back from the table of conventional orthodoxy and its bland concoction of spiritual sedatives. In the twilight of theism, people are starting to give voice to their doubts, but also, increasingly, to their questions, their long-buried intuitions, and their rising new-world aspirations. They want more than anything to be real, to be fully present, and deeply engaged in life with creative authority. This inward turn is the critical move of post-theism. It’s not about pulling down orthodoxy or refuting its god, but rather simply letting go and quietly sinking into being. Quietly is a reminder that words at this point are like hooks that can snag and slow one’s descent, running the risk of turning even this into another religion with its own esoteric orthodoxy. The ego and its constructed word-world of meaning need to be left behind so that consciousness can softly settle into the still center of contemplative awareness. Here all is one. There is only this. Here is born (or reborn) that singular insight which inspired us to tell stories in the first place. Now, perhaps, with a lifetime of experience and some wisdom in our bones, we can tell new stories. It’s always been and will always be here and now. In “The Mythic Quest of Captain Ego” I offered a model that helps us track individual identity through a gauntlet of developmental challenges that both shape the ego and continue to influence it throughout the lifespan by way of deep patterns called archetypes. 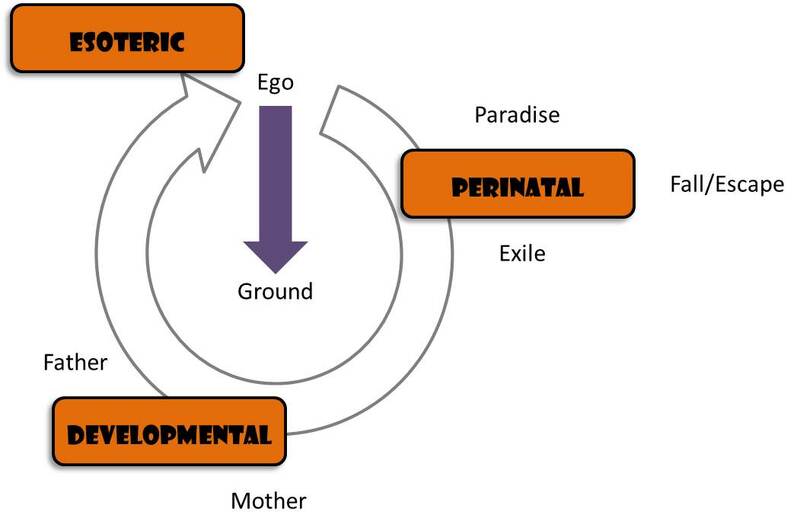 These archetypes belong to larger clusters that correspond to the formative phases of birth (the perinatal cluster), early childhood (the developmental cluster), and a critical passage that is unlocked only to the degree that these earlier challenges were relatively successful, opening into an experience of the grounding mystery of being itself (esoteric cluster). 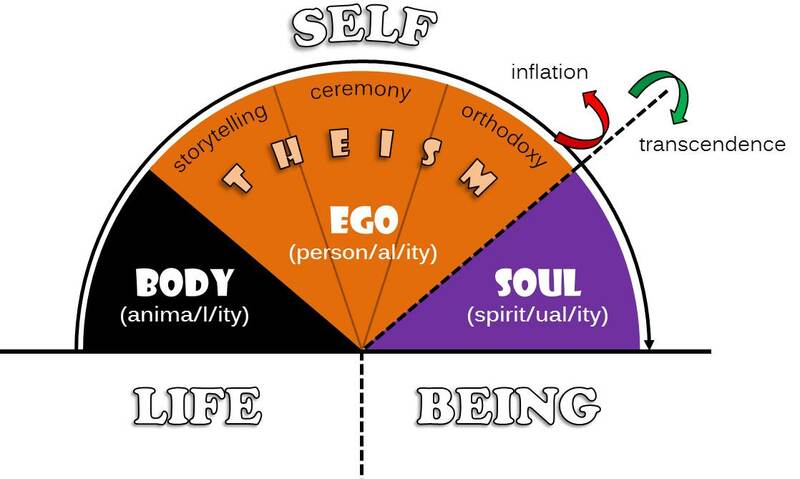 It is at this threshold, in fact, where ego (identity) is surrendered to soul (communion), that theism as a paradigm of religion gives way to post-theism. Indeed, if we can better understand how it goes (or gets blocked) for the ego, we will have in hand a key insight into the evolutionary purpose (and common pathologies) of theism as well. This is because theism and ego are coeval (of the same age and equal duration). How it goes with ego, so it goes with theism – and vice versa. In this post I will explore the healthy and dysfunctional forms of both. Before I begin, however, perhaps that last statement – about ego and theism developing together – needs to be explained. The essential idea is that ego, as the executive center of the personality, has its counterpart in the deity who is executive-in-charge of the tribe and its world. “Tribe” is here playing a mediating role, shaping the individual’s identity as “one of us” according to the moral ideal represented in the patron deity. At this stage (in theism) the game is all about clear roles and rule-bound relationships, as the arena where the social constructs of identity, membership, and obligation are set in place. The patron deity serves a dual function as the sovereign authority behind the tribe’s moral code, and as the focus of worship and aspiration in its members. In obeying their god, individuals are cooperating for the common good, while in glorifying the divine virtues of grace, mercy, compassion, patience, wisdom, forgiveness (etc.) – and seeking all the while to be like the deity in these ways – they are gradually growing toward that ideal. Along the way, what had been addressed as outside the self (i.e., the patron deity) is slowly internalized, as it were, until the individual is able to drop the identifier of “me and mine” altogether and simply be one with everything. It happens, and all too frequently, that ego development gets hung up (or blocked), which, if the hang-up is fairly widespread across the tribe, can have a distortion-effect on the deity as represented in art, story, theory and doctrine. As a people regress, so does their patron deity. Just as in positive development the deity contains dormant or newborn virtues of a morally advanced community, when its official custodians (the priests and theologians) slip or get pulled into degenerate vices such as dogmatism, bigotry, vengeance and cruelty, the deity undergoes a similar makeover and soon the tribe as a whole falls into its gravity. So what is a healthy ego and deity, and what are their contrasting pathologies? First we should recall that ego-formation comes about, initially at least, through a process of restraint-and-redirection, as the impulsive drives and animal urgencies of the body are trained into socially appropriate behavior. Of course, the underlying urgency of biology and instinct doesn’t just stop doing what nature requires, which means that ego is first gained and thereafter suspended just above the borderline separating the personality from this primordial (deeper, darker) animality. Added to this responsibility of managing the animal impulses of the body – at least the small percentage of milder inclinations that can be controlled – is the task of establishing a center in the personality where moods can be kept in balance. As distinct from urges and impulses, moods are global and sustained internal states that work to match an organism to its environment and motivate behavior that is adaptive to the challenge at hand. Because circumstances change and new challenges are always presenting themselves, particularly in the social arena where ego is at home, the personality needs to adjust quickly. A third factor of ego strength is its ability to hold the personality together as a whole. Various and sometimes divergent streams of affect (feeling), motivation, thought, and disposition need to be supervised, coordinated, or reconciled for the sake of maintaining a unified self. There are times when a certain stream comes close to breaching the ego’s hold, which, if successful, could result in guilt, embarrassment, or personal injury. As the executive center, ego serves the important function of self-integrity. In summary, then, healthy ego development – and let’s remember that this will be true of the divine ego of the patron deity as well – is demonstrated in a stable, balanced, and unified identity. The personality is kept from falling through the floor into animal urgency, it is able to maintain a center of emotional composure, and it is held together under a governing director who monitors all things “me and mine” (our Captain Ego). From this stable, balanced, and unified platform, an individual is capable of leaping out into a larger reality, transcend the self entirely, and consciously join the present communion of all things – which is the mystical experience of spirituality. Against this profile of healthy identity we can more easily describe the different types of pathology that afflict both ego and the patron deity. With that said, my description of pathology in the ego and theism’s deity is not intended to deny the legitimate cases where something is really, and deeply, wrong with the brain (in ego’s case). While I have chosen the names of a few outstanding and “popular” pathologies for my purpose, I readily concede that there are times when biology has “gone wrong” and a patient needs medical (drug and/or surgical) intervention. But such cases are much rarer than is commonly believed, which is part of the delusion that the conspiracy is intent on perpetuating. So here we go. When the boundary separating ego from the lower animal urgencies is not very strong, the personality is not able to control the border and keep spontaneous impulses in check. Consequently the identity system will unpredictably collapse and be overtaken by sudden urges or reactions, making the person behave in socially inappropriate ways that end up damaging relationships. Do you know anyone like this? What I’m calling borderline personality, then, is not so much a clinical disorder as an extreme variance in identity formation where ego strength is insufficient to keep the personality above the surface of animal urgencies. Individuals who lack a stable ego often suffer from loneliness from having offended their former friends, and a chronic restlessness in never knowing when the floor might fall out from beneath them. 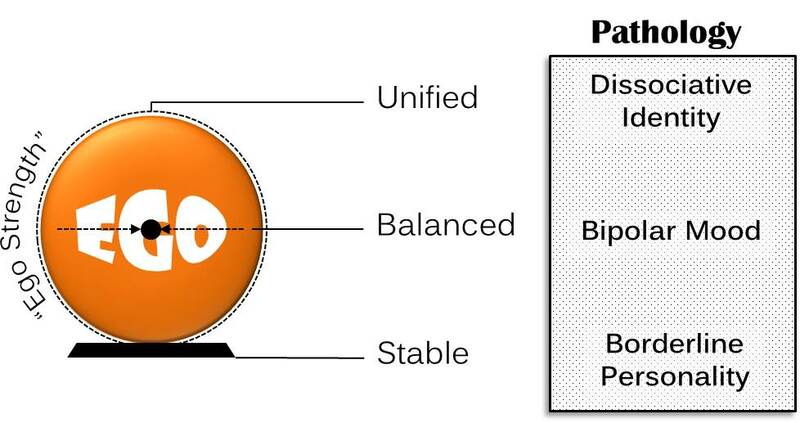 What happens when the missing part of ego strength is the center that would otherwise hold a person’s moods in balance? Wide and erratic swings, and not only of the familiar “manic” to “depressive” poles. Wild fluctuations in mood inevitably land the individual in situations where the body’s internal state is completely incompatible with his or her present circumstances. Because moods are more global and enduring than the momentary feeling responses that naturally occur in the course of normal experience, a bipolar person can be so totally possessed by a mood that he or she is insensitive to the surrounding cues. The bipolar personality is also socially disruptive, but in a different way from the borderline personality. While the borderline issue puts everyone on the edge of not knowing when the next outburst or collapse is going to happen, bipolarity trains those around the individual to withhold confidences and responsibilities from him or her out of concern that they won’t be followed through to completion. Do you know anyone like that? Finally, when ego strength is unable to hold the personality together as a unified system, the numerous undercurrents of identity, attitude, motivation and behavior that might normally be allowed expression by Captain Ego in appropriate social environments and situations, can simply and unexpectedly “show up.” Roberto Assagioli, the Italian founder of psychosynthesis – stressing the necessary work of constructing a healthy self, as opposed to Freud’s strategy of taking apart the sick self with psychoanalysis – referred to these relatively self-contained minor identities within the dominant personality as “subpersonalities.” They are normal components in the normally complex personality system. But when the ego is too weak to maintain a unified self, the personality “dissociates,” giving way to any one or a number of these subpersonalities. Observers of this phenomenon are often perplexed at how so-and-so is suddenly “an entirely different person” than he or she was just moments before. This isn’t about impulses breaking through the floor, but rather coherent substreams of alter-identity that take over in a social situation. Now that we have a model of ego strength before us, along with an understanding of the major pathologies that compromise it, I will return to my original suggestion. 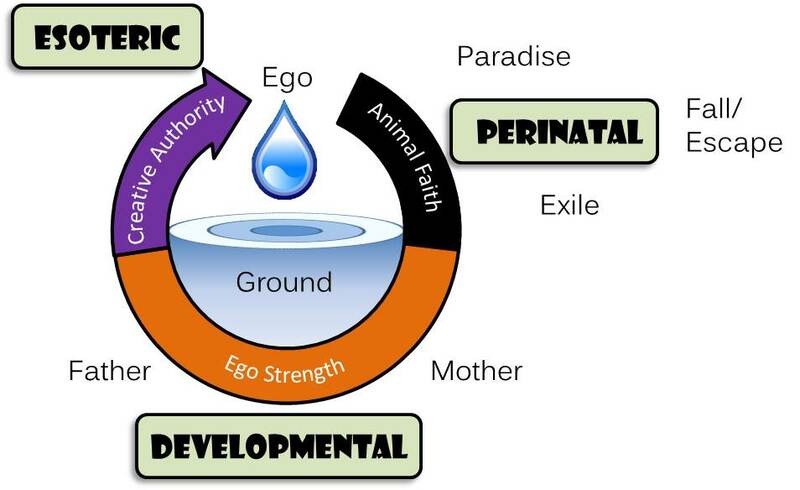 Just as there is a developmental partnership between the healthy ego and its patron deity, where the external causality and higher virtues represented in the deity are gradually internalized by the caring and self-responsible ego, so we should expect to find instances where ego pathology (borderline, bipolar, dissociative) is reflected in depictions of God – for example as temperamental, capricious, and internally divided (think of the subpersonalities of Yahweh in the Bible as threatening and wrathful, or as compassionate and forgiving). Do you know a religion like that?